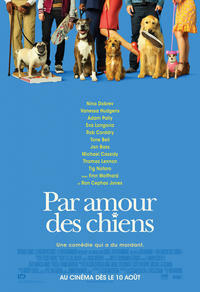 Difficile de trouver plus paresseux et insignifiant que ce film choral bas de gamme, qui célèbre sans une once d'imagination le pouvoir rassembleur des chiens et leur rôle indéniable dans la vie affective de leurs maîtres. A bevy of cute canines provide innocuous distraction from the predictable private lives of a dozen or so humans in this lightweight romantic comedy. Of course, it's the animal performers that are the real stars here, and they don't disappoint. They're so adorable in their onscreen antics that dog rescue agencies should establish pop-ups in the theater lobbies to take advantage of susceptible audiences that've been inundated with doggy cutesiness for the better part of two hours. If you want to laugh, cry, and celebrate the animals in your life, Dog Days will have you sitting and staying with very little problem. You won't be surprised by its sentiment or observations, but this well-cast celebration of the timeless bond between humans and dogs is nimbly funny. The best part? No other summer flick this year will include a scene with a stoned dog, cutely watching the ever-trippy « Attack of the Killer Tomatoes ». That's a guarantee.